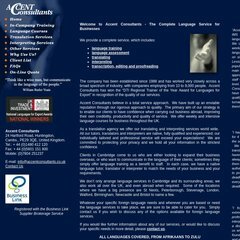 Topics: Language Training, Language Assessment, Translating, Interpreting, Transcription, and Editing And Proofreading. Fast2host Uk Hosting England is the location of the Microsoft-IIS/6 server. The site is programmed for ASP.NET. There are 2 Nameservers, ns1.fast2host.com, and ns2.fast2host.com. PING www. (95.128.129.105) 56(84) bytes of data.